At our family reunion picnic a couple of years ago, my aunt Harriet gave me Mini Dessert Serve ware set that she thought I would enjoy using for entertaining. 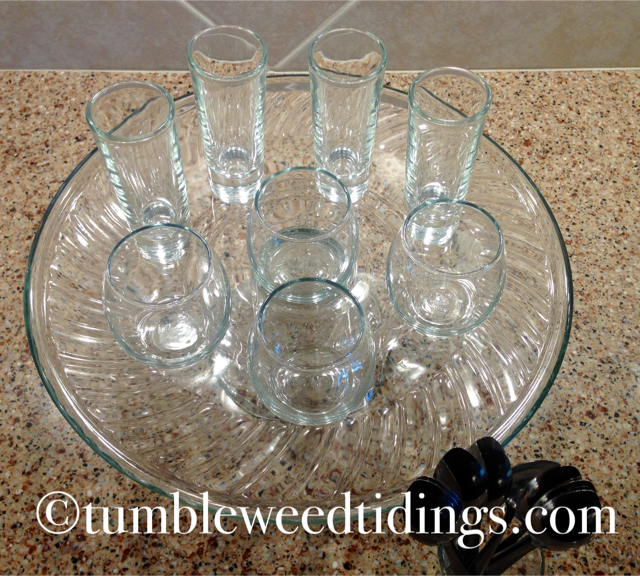 It came with 8 small shooter glasses in two styles and a glass pedestal to present them on. There were also mini spoons to eat with. This set had my name written all over it! What is it about miniatures that capture our attention? Doll houses, mini cakes made with an Easy Bake Oven, tiny tea sets…we loved them all! There is just something special about having foods served in small containers. 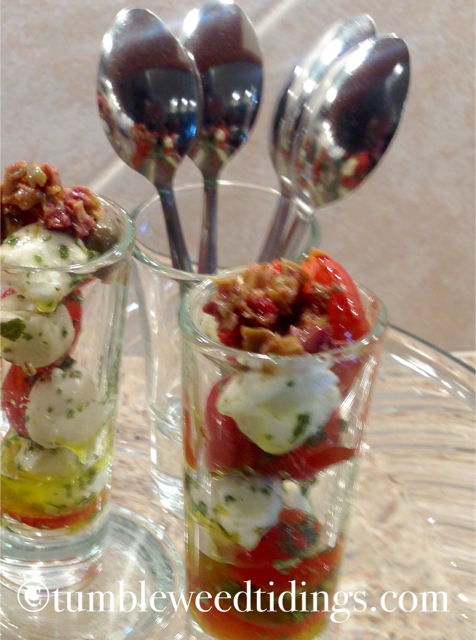 From mini dessert shooters now offered in many restaurants, tapas full of savory delights, and even Jell-O shots, small easy-to-handle foodstuffs are definitely in vogue. A few years ago at our Christmas Open House, I bought some small plastic containers and made mini cherry cheesecakes in them. 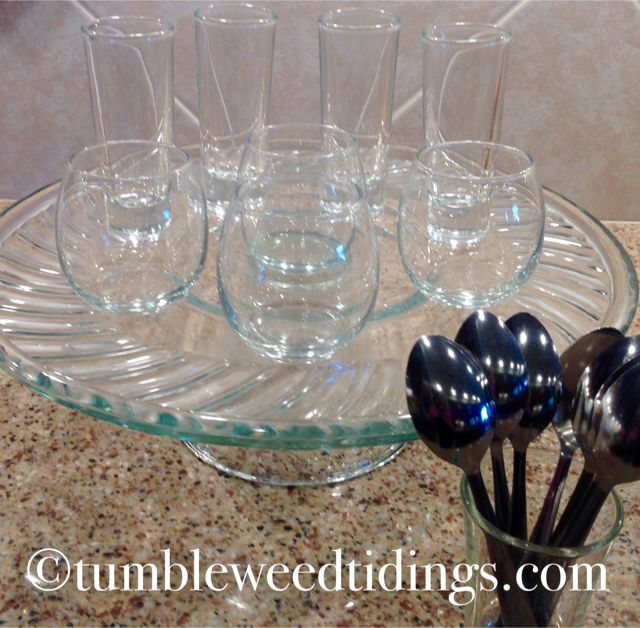 I even found little sample spoons like they use at the grocery stores, and had them on the platter. At the same party, I made up individual shrimp cocktails by layering cocktail sauce, shrimp and small slivers of celery spears in each plastic vessel. 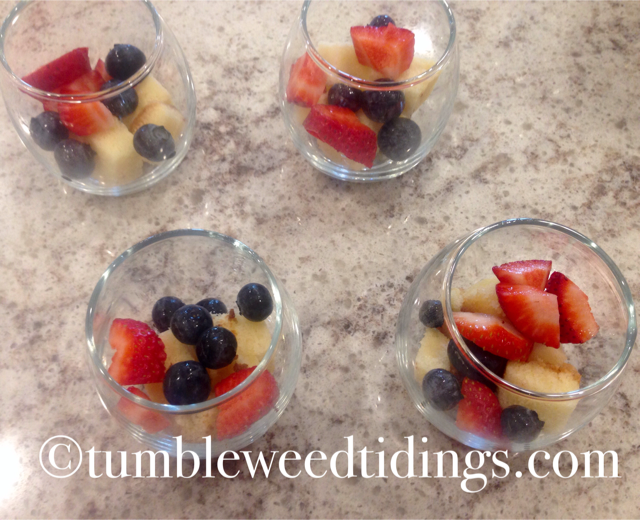 People really seemed to like these mini pre-portioned offerings, and they went quickly. 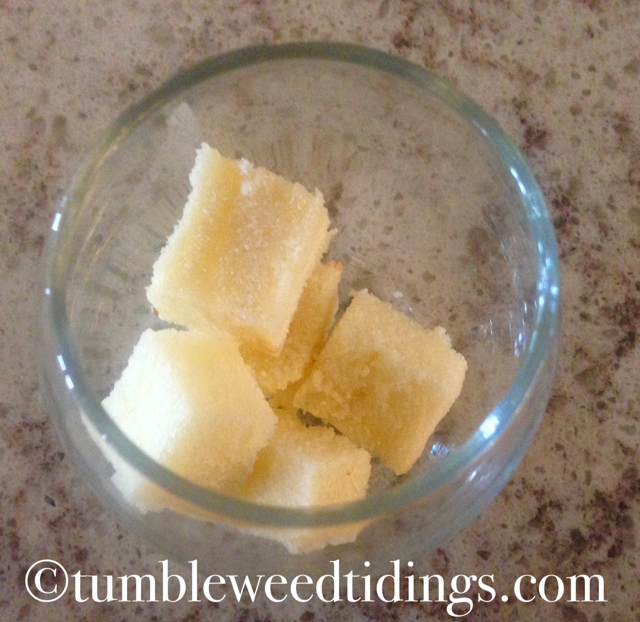 So today, I felt challenged to come up with some recipes that are individually portioned favorites in miniature, and put this cute set to use! First, a savory option. For this, I created a mini Caprese Salad by making a mixture of mozzarella balls, basil, cherry tomatoes, olive oil, salt and pepper. After filling each mini container, I topped them off with a sprinkling one of my favorite ingredients, olive tapenade. 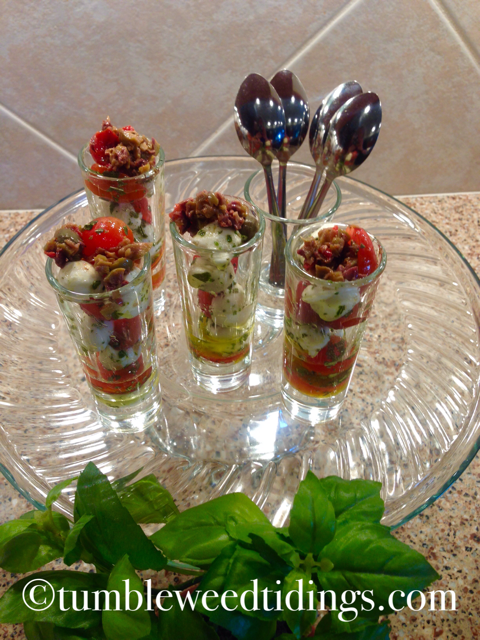 These mini Caprese Salads would be delicious for a first course or salad at a dinner party, or a welcome addition to any party buffet. The second option in miniature is a strawberry and blueberry parfait, perfectly refreshing for summer. 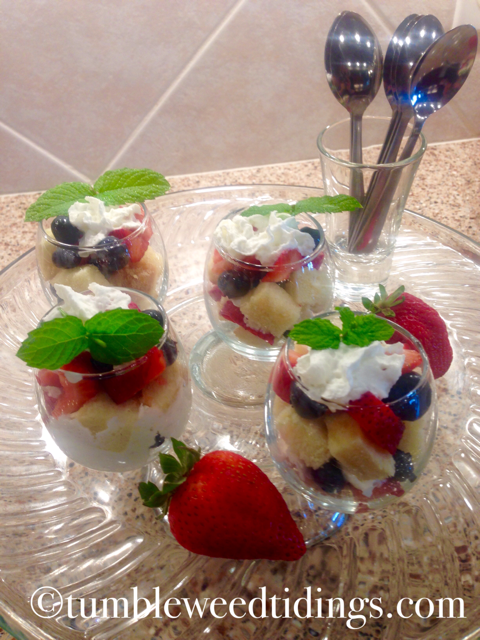 For this dessert, I simply layered store bought pound cake cut into croutons, whipped cream and fresh berries. The final garnish was fresh mint from our garden. You could substitute Angel food cake for the pound cake, and any fruit of your choice. 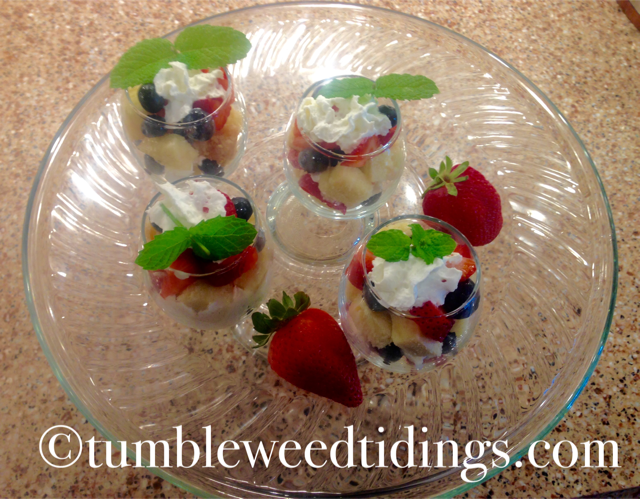 The whipped cream layers could also be substituted with vanilla pudding and bananas for another great dessert choice. 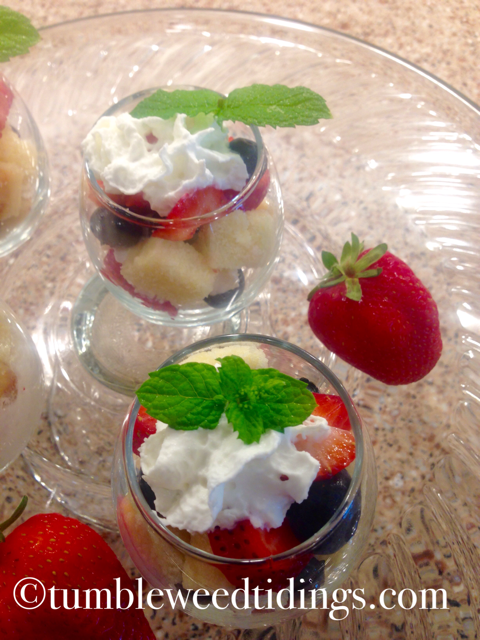 These parfaits only get better as they sit in the refrigerator, as the berries and cream soak into the cake. I hope I’ve inspired you to think about getting on the shooter bandwagon. 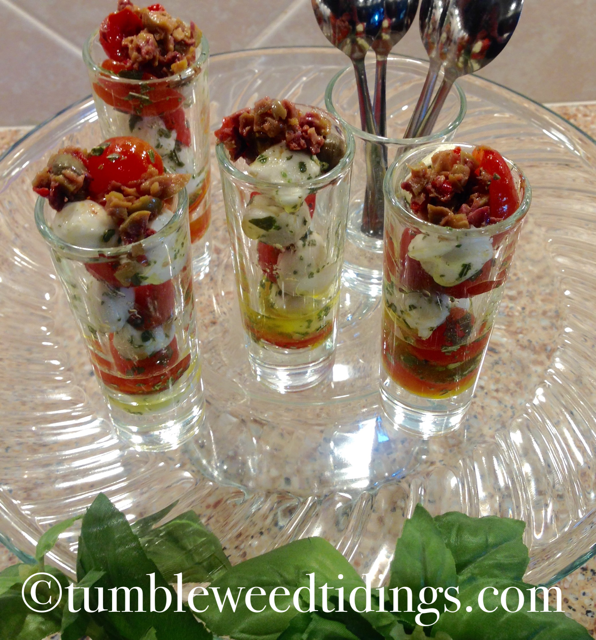 The possibilities for making miniature appetizers or desserts are endless. Best of all, they are easy to prepare ahead, leaving you more time to enjoy your guests. And that is good news for any host or hostess! Not only does it look good, it tasted great! Great ideas Diane. So pretty, and I imagine, yummy! 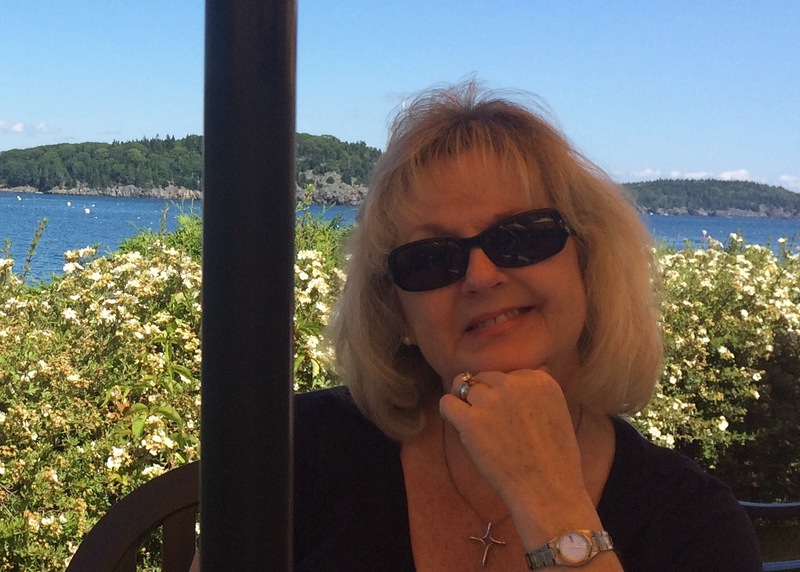 Thanks, Loralee! 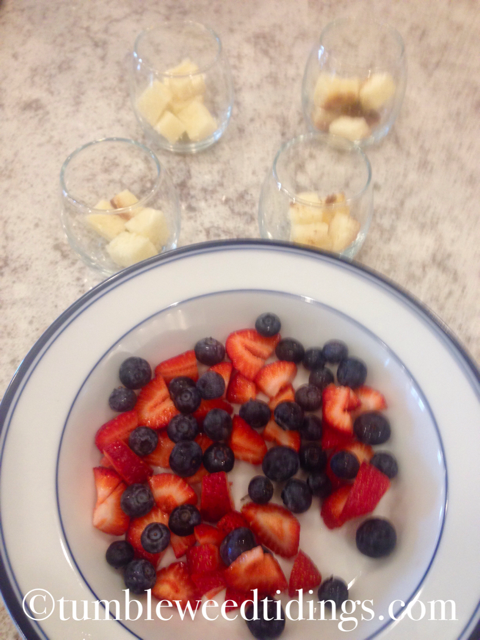 They were fun to make….and eat!